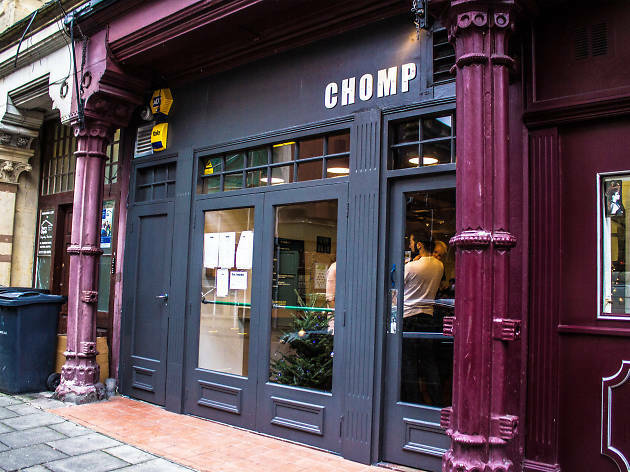 The battered old French number plate that hangs on one wall hints at Chomp’s origins: it was once a mobile business, serving bacon baps and burgers from a converted Citroën horse van. Word of its quality spread fast, and the van became a must-find, regardless of whether you lived or worked near one of its chosen locations – which included behind Temple Meads and in Bristol’s Lego-style Harbourside development. 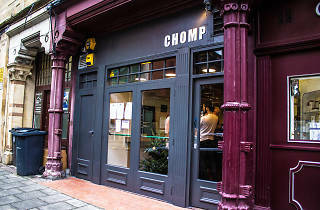 Chomp’s first permanent premises might have only opened at the end of 2014, but the restaurant already had a loyal following. The bacon baps (£3.50) remain as a morning offering, while the choice of burgers is refreshingly simple compared with the overwhelming number of combinations found in the city’s other burger bars. For simplicity, stick to the house classic (£10), cooked medium and served in a brioche bun with fries and coleslaw. There’s also an 8oz ribeye steak for £16, and an excellent veggie burger (the Bloody Veggie) for those who want to give the meat a miss. From the beers, try the Chomp house brew, a 6 percent pale ale that’s specially brewed for Chomp by old collaborators Wiper and True. ‘Beef, beer and bourbon’ is written at the top of every menu, and there were 10 different bourbons available at the last count. If you’re feeling brave, try the pickleback – a bourbon followed by shot of pickle juice. Not one for the faint-hearted.